A special book about the end of one life and the beginning of another. Life?s That Way is a modern-day Book of Job. In August 2003, Jim Beaver, a character actor whom many know from the popular HBO series Deadwood, and his wife Cecily learned what they thought was the worst news possible? their daughter Maddie was autistic. Then six weeks later the roof fell in?Cecily was diagnosed with stage-four lung cancer. Jim immediately began writing a nightly e-mail as a way to keep more than one hundred family and friends up to date about Cecily?s condition. Soon four thousand people a day, from all around the world, were receiving them. Initially a cathartic exercise for Jim, the prose turned into an unforgettable journey for his readers. Cecily died four months after being diagnosed, but Jim continued the e-mails for a year after her diagnosis, revealing how he and Maddie coped with Cecily?s death and how they managed to move forward. Life?s That Way is a compilation of those nightly e-mails. Jim?s experience is universal for anybody who has lost a loved one. But Life?s That Way is not solely about loss. It is an immediate, day-by-day account of living through a nightmare but also of discovering the joy of a child, of being on the receiving end of unthinkable kindness, and of learning to navigate life anew. As Jim says, these are hard-won blessings. But then again, life?s that way. Jim Beaver's Life's That Way is the most sincere account about the battle with cancer I've ever read. The book is a collection of e-mails Jim sent daily to family and friends about his wife's struggle with stage IV lung cancer. For most people who have experienced the disease this is indeed a painful read, but it also offers hope and reasons to smile. When Cecily was diagnosed, an unbelievable number of family members and friends offered to help in any way they could, making Cecily, Jim, and their little Maddie feel a little less alone in their fight. Jim is honest in relating his thoughts and emotions. Reading about his anger, resentment at the unfairness of the disease, and profound fear makes it easier for people to accept these feelings when they experience them themselves. This is a touching, heart-breaking book everyone should read. Not only because almost everyone knows someone who had cancer or even had it themselves, but because it can teach us about our own strength and courage when they're needed, and that human kindness and selflessness has no limits. Terrific read, couldn't put it down!! I'm normally a pretty cold-hearted person, but this beautiful and honest look inside Jim Beaver's life pushed me to tears; both of sadness and joy. Anyone who has been touched by cancer or some other tragedy will relate to a lot of things in this book - the fear, the courage, the determination, the joy, and the heartbreak. I was so struck by how honest Jim was with his feelings and how beautifully written these notes to family and friends were. I felt like I knew the people he wrote about because he welcomed the readers into his circle. And what a circle! Hollywood is often portrayed as a cold place, but Jim was shown another side to it once Cecily was diagnosed. Do yourself a favor and read this book. The complex feelings surrounding the events of that year are easy to read in that everything flows so well, but at the same time, it's one of the hardest things you'll ever peruse. I was a fan of Jim's and Cecily's before the book and now I feel almost like a part of the family. I received my copy of "Life's That Way" in the mail the night before last and I'm already halfway through. The only time I have put the book down is when the pages bluured too much through my tears to continue reading. Being one of the people who follows the author, Jim Beaver, on his Myspace blog, I knew how this book would end in many ways. I knew there was no miraculous recovery, no last-minute cure, and yet, each page kept me on the same teetering edge of hope and worry as I'm sure all the extended friends and family were in when the original emails were sent in 2003/2004. This is not just the story of one family touched by life-threatening medical issues, but of every family who finds themselves in this place in life. It chronicles the aftereffects of such a diagnosis - grief, shock, fear, impatience, confusion. To borrow from the book's title, "Life's That Way". To the family of someone diagnosed with a serious illness, life does not simply stop to allow for shock and grief. There is still laughter among the heartache and grief in the middle of joy. If I'd never heard of Jim Beaver, never 'known' Bobby Singer, never watched him in any TV Show, I would admire this man simply for the story he's shared in this book. The book jacket calls this a memoir. It is so much more than a memoir; to me, a memoir is a story that looks back on an experience in a person's life. It encompasses the lessons learned and the balance achieved after one has survived. Jim's story is told very much in the now. He wrote nightly emails to family and friends--who passed them on to other friends--almost every night for a year. As you read this story, you are swept up in the events as they happened to Jim and his family. It is extraordinary. I've never read a book quite like it. I tend to stay away from non-fiction, preferring the escapism of fiction as I feel my life contains enough real-world drama. And I will admit that the reason I picked this book up was because of Bobby. But I have since recommended the book to my book club--all but one of whom have no idea who Bobby Singer is--and to anyone else I can. Because I believe that anyone can read this book and walk away with a different perspective on their life. Regardless of if you've experienced the loss of a loved one, or had a challenging diagnosis of your child--Jim's story transcends those details. It's a love story, really. Love of self, love of selflessness, love of humanity, love of a mate, love of a parent, love of a child. It's honest and raw and it hurts to read and I couldn't put it down. When I saw the title, I interpreted it to mean that's just how things are. But when you read the book, you realize it's a compass. Move forward, keeping going, life is that way. I am married to an amazing man. He's my friend, my lover, my greatest source of strength and my greatest source of frustration. This June we will have been married 8 years. We've been through serious health scares, surgeries, debt, loss of loved ones, the birth of a child, change of careers, and the seven-year-itch. As I read this book, though, I found myself wondering if my husband and I knew each other as well as Cecily and Jim. At one point in the story, Jim's entire entry is a laundry list of things that Cecily loved. There are 73 items in the list. And it's basic, and it's beautiful, and it made me think about my guy. And wonder if I could list 73 things that he likes. And if I'd be right. Jim's unexpected, quick phrases sucked the air from the room and had my heartbeat echoing in my ears as I applied his passion to my own life and came up short. His simple, eloquent wording struck a chord in me that is still playing loud and strong days after I've finished this story of a piece of his life. Sometimes, in a moment of instinctive protection, I don't allow myself to truly feel all that a moment in time allows for. I curl in and let the emotions bounce off of me so that I can keep moving forward. But I realize that by doing this, I've missed out on the good parts of such a moment as well as the bad. And therefore, it's harder to remember the moment in it's entirety. And there are some moments, however painful, however ugly, however dreaded, that need to be remembered and savored and learned from and appreciated. Because that's how we grow. That's how we learn. Each night we are privy to Jim's thoughts, emotions, anger, sadness, glory, humility, and joy. He writes with unabashed honesty as he travels the path of his wife's disease, going from frightened spouse to single parent and letting us know that above all, there is goodness in the world. Despite the darkness that settled on their little family, there was light all around them and it sustained him and he was able to continue on because of it. I guarantee you that if choose to read this story, if you choose to travel this journey, you will emerge on the other side with your world brighter. You may cry, you may rub at your aching heart, you may even want to put it down half-way through because you just can't take any more... but when you finish this year with Jim, you will know that humanity is one of the greatest things on this earth because of it's capacity to give and it's need to take and it's fortitude to fight through the darkest times of life. A sweet, heartbreaking, inspiring, and yes funny, slice of life is recorded in the emails of Jim Beaver's Life's That Way. Early in the book, I realized that my preconceptions of the title and the subject were in error. Life's That Way isn't the passive equivalent of "life is like that" and there is nothing we can do. Life's That Way is pointing in a direction and making a conscious decision to not give up, to be anything but passive, and to run or walk and sometimes crawl toward Life again. Jim Beaver has been contributing mini-bios and comments on IMDB for years. I'm not sure when I finally realized he was an actor; I always thought of him as a writer. And then, he started writing about the illness of his wife, Cecily Adams, and we all learned more about his life as a husband, father and actor. Jim started writing writing E-mail to his friends and family in the aftermath of his wife Cecily's sudden diagnosis with advanced lung cancer and their young daughter Maddie's diagnosis with autism. He followed their treatments, and how the illnesses impacted the family. Jim has collected his various letters and postings in Life's That Way, an inside-out look at the most traumatic year of his (or anyone's) life. The book is sad, depressing, unflinchingly honest but ultimately uplifting with some very vivid characterizations. Jim Beaver turned a years worth of emails, which chronicled the diagnosis of his daughter with autism and his wife with lung cancer into a poignant memoir. "Life's That Way" is a declaration of love, to his wife Cecily, daughter Madeline Rose, his family and a multitude of friends. He bares his soul,allowing us to share his courage. And in doing so we become stronger. This book speaks of hope and undying love. It's not everyday you come across a memoir written in real-time, especially one as soul-baringly honest as Jim Beaver's "Life's That Way". This refreshingly, sometimes brutally, frank and heart wrenching account of his family's journey through the diagnosis of terminal illness, of raising an autistic child, the dark times after the loss of a soul mate and the later loss of his own father has the ability to make you weep and, at times, laugh as this grizzled cowboy tells family and friends via nightly emails about the circumstances his family is facing and how they are all coping in their various ways. It is not surprising that the list of email followers swelled into the thousands as people sent the accounts on to their family and friends in the hope that they would bring some hope or solace to them. This memoir is not sugar-coated or heavily censored to show the author in a kinder light, and Jim Beaver pulls no punches when admitting to his own human faults when dealing with situations that would drag most people over the precipice of despair. His self-deprecating style of writing draws the reader in, they feel they know the people Jim writes about, and they care about the hurdles and outcomes that he and his family face. He also shows the lighter side of his family, recalling cherished moments and events both within their immediate and extended families. "Life's' That Way" is a poignant declaration of love for his treasured wife Cecily and their daughter Madeline Rose as each struggle to overcome their own inner turmoil and the stumbling blocks life has thrown at them. Jim passes on the wisdom of showing family and friends you love and admire them at all times and the importance of hope, compassion and finding the gifts and lessons in all situations. The reader finds a great respect for the dignity with which Jim and Cecily approach their dilemmas of dealing with her cancer diagnosis and imminent death and his future role as single parent of a child with special needs. While they both approach the situation with grace and humour, they also show their humanity and frailty, their deep and abiding love for each other and their much wanted child, and their knowledge of how blessed they are to have each other, their adored Madeline Rose and a supportive network of friends, family and co-workers. If there is a list of books to help a person understand the true emotional rollercoaster of a terminal prognosis and its aftermath, then this book should surely be on that list. 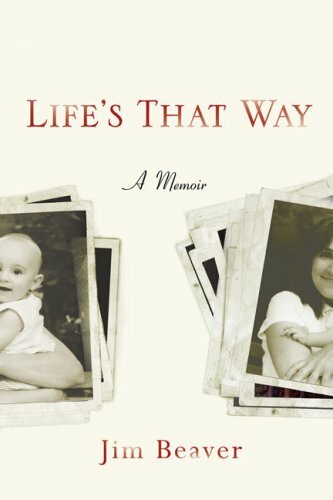 "Life's That Way" is a testimony to love, hope, loss, grieving and the rebuilding of life one tenuous step at a time. A box of tissues study of life not to be missed and a timely reminder to talk from your heart. This is a marvellous book about a horrible time. Just writing that makes me cringe because it almost seems insulting, but I've no better way to describe it. Jim Beaver has shared the most tragic time in his life and his struggle to recover from it - shared his darkest hours through his writings with family and now complete strangers in an attempt to help anyone else struggling with such devastation as the loss of their second half or even those of us who know others in similar situations. Trying to give hope where there might seem to be none and showing others that people can share love with those in need when least expected. A friend picked up a signed copy for me at a book store signing Mr. Beaver was attending and I am so glad she did. "Life's That Way" is a loving tribute from Jim Beaver to his wife, Cecily (daughter of Get Smart's Don Adams), who died of Stage IV lung cancer. It was originally written over a 1-year period as e-mails sent to family and friends to keep them updated on his wife's progress (and her fight against the illness). In the book, Jim's e-mails are filled with hope, heartbreak, but most of all, love. I cannot say enough good things about this book and how it touched me as a person who has lost friends and family members to cancer. If I hadn't already been a fan of Mr. Beaver's work on television (Supernatural, Deadwood, Harper's Island), then his book has forver made me a devoted fan of his writing. This is the first book in a long, long time that I pulled an all nighter to read. I went to bed at 1 am with the intention of flipping a few pages and going to sleep. At 4 am I forced myself to set it down, turn off the light, and try to sleep. At 4:30 am I conceded defeat to the pull of the book and picked it up again. At 7 am I finished it and marveled at it and slept a few hours on it. I got up to tend to my dogs, and before going back to sleep I needed to post this. Jim Beaver is someone I admire. Yes he's an actor. Yes he's in one of my favorite television shows. That isn't why I admire him. He's also a former Marine who served in Vietnam. He's also a playwright. He's also a biographer. He's also a single dad, and a very wise human being. This is this Renaissance man's memoir about the year encompassing the discovery that his wife, Cecily, had cancer, two months after their two year old daughter, Maddie, was diagnosed with autism, and everything that transpired for 12 months from that point. It is a compilation of nightly emails he authored to friends and family during that year, which were then forwarded to further and further ripples until they were reaching about 4000 people. And reading them is both a privilege, and a remarkable journey. I found this book incredibly compelling from the very first page....... the raw, honest, humorous writings of Jim Beaver left me unable to put the book down. Although it's a book about tragic loss, it's so much more...... it's a beautiful love story between a husband and wife ...... a mother and her daughter...... a father and daughter.